I ask Egyptian friend where a client invited him this year. It was a Turkish restaurant ! There is a reliable thing with a Japanese-style dish! I want him eat Japanese food! 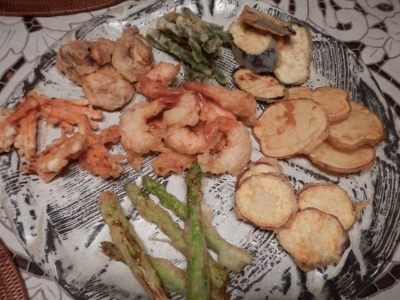 A shrimp, a potato, an eggplant, a sweet potato, asparagus, a mushroom, a carrot, a green pepper, an okra. The Japanese eats tenpura with soy sauce and vinegar. I had with salt of Alsace this time. He said "one drop of oil did not enter, and the white rice was healthy", he also ate a lot. He a lot of ate, my mother was pleased very much. What do you pronounce "Japan"? The data which "Nihon" called a land slide victory in collaboration announcement such as the National Institute for Japanese Language recently were given. This team made a database "Japanese sporken language corpus" for language studies. Because collection of spoken language is difficult, it is the field that a study doesn't readily go ahead through. It seems to be recorded about 7,520,000. It is said that it is the world's greatest thing in a corpus of spoken language. By an accent of NHK, what do you read with formally? When there were only 3% the person who was able to pronounce it how difinitely goes for this corpus. By the way whichi is a correct answer? I like reading with "nihon". however, I pronounce it "Nippon" when I show a foreigner it. I think it is rhythmical and feels like being easy to learn it. And I think only our country that there are two readings of by a name of a country. A name of country is not decided, too. I feel like symbolizing "vague Japan. Like its symbolic flower, after it is blown to the four winds, it will still bless mankind with the perfume with which it will enrich life. "Hana", a nose, an edge mean the only tip in Japanese. Because a flower reaches the tip of the trees and plants, we say "Hana". Speaking of a Japanese flower, it is a cherry tree. "Sakura"
However, after this was the Edo era. For an old days, a flower of the plum"Ume" which bloomed very first was a flower for a Japanese in spring. I think, many people did not know Inazo Nitobe. Till his portrait is printed by a five thousand yen bill. I am the one, too. He was born in the Edo era. And he played an active part in the Meiji era. He took English education from 9 years old. His wife was American. It is to be surprised a little.Probably the one where he thought in English than Japanese may have been simple. It is still wide, and a book written in an English sentence of "the Bushi-do" that he published in 1900 is read so that world people can stream down Japan and a Japanese. Tom Cruise seems to have read like "the Bible" many times. However, does a Japanese only for which know this book? The opportunity when he wrote this book, a Belgian asked him. "Does not Japan have religion? What is a mental prop?" it will still bless mankind with the perfume with which it will enrich life. From "bushi-do The Soul of Japan"
Of course a flower means a cherry tree. In the days of a thing of his parent "a flower a cherry tree, a person samurai" He introduced it into the world as a Japanese heart.